I stood still at the mouth of the cave. Stalactites, like angry teeth hung ready. The dark hungry maw open before me. Scared and shaking, I knew not what to do. but the darkness devoured me. swallow me whole, it waited. and menace could I feel. What it held, I could not fathom. out my arms and stepped inside. 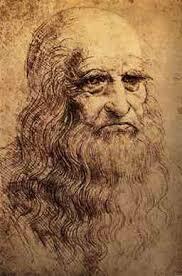 One of the very few autobiographical texts that Leonardo Da Vinci wrote was about the time in early childhood when he discovered a cave and his fear and curiosity about what lay inside. We can only imagine what he thought.